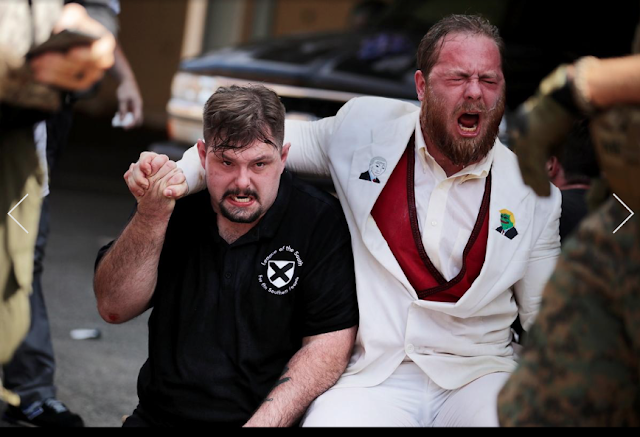 Mod: With Neo-Nazis like Sebastian Gorka and Steve Bannon calling the shots at the Trump White House, is it any wonder that the murders in Charlottesville happened yesterday? Even Republicans are starting to call Trump out. It is better late than never. GOP Senator: My brother didn’t die fighting Hitler so Nazis could go unchallenged here (DeadState.com link): This Saturday, GOP Senator Orin Hatch spoke out against the violence in Charlottesville, Virginia, saying that it’s a slap in the face to veterans who died in World War II fighting the Nazis, one of whom was his brother. President Trump condemned the clashes but raised eyebrows when he said that “many sides” were to blame. Hatch was 8-years-old when his brother was killed in WWII, and he’s said that his brother’s memory is what compelled him to go into public service. His bother, Jesse, was 20-years-old when the bomber he was a turret gunner on was shot down over Austria. ‘The alt-right is a terrorist movement’: Ex-Bush ethics czar blasts Trump administration’s support of racists (Raw Story link): During a segment of a special MSNBC broadcast featuring Joy Reid, former ethics czar to President George W. Bush Richard Painter blasted President Donald Trump’s stubborn refusal to denounce white supremacists and his attempt to equally blame the left for the violence that killed a 32-year-old woman in Charlottesville, VA.
Republican lawmakers criticize Trump response to Charlottesville (MSN News.com link): Republican lawmakers went after President Trump on Saturday over his statement on violent clashes in Charlottesville, Va., with one senator going as far as saying Trump needed to call it a "terror attack by white supremacists." "Mr. President - we must call evil by its name. 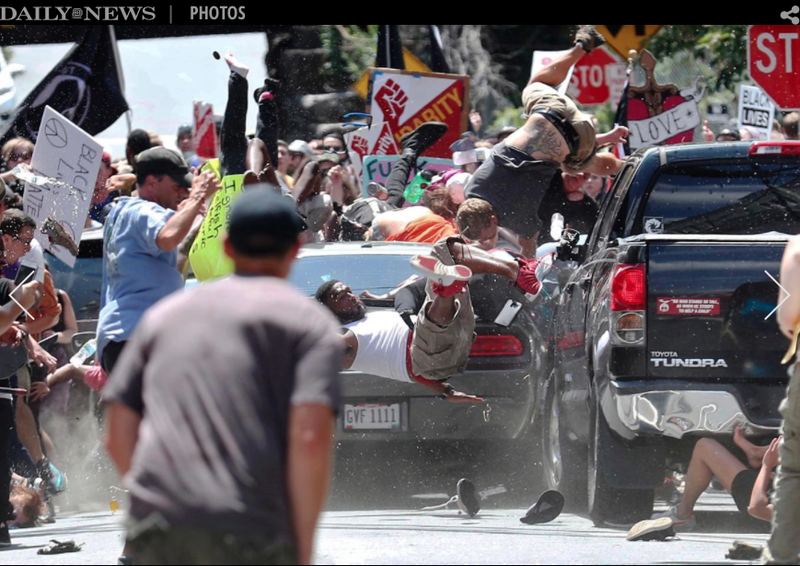 These were white supremacists and this was domestic terrorism," Sen. Cory Gardner (R-Colo.) tweeted. Gardner was joined by Sen. Marco Rubio (R-Fla.) in directly calling out Trump. "Very important for the nation to hear [President Trump] describe events in Charlottesville for what they are, a terror attack by white supremacists," Rubio said on Twitter. 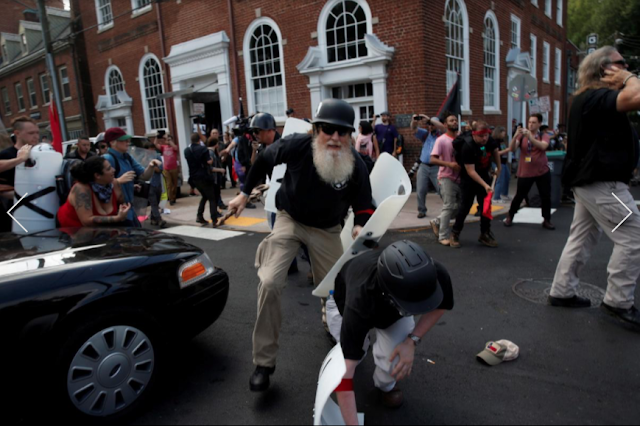 Trump condemned the "egregious," racially-charged clashes in Charlottesville, Va. on Saturday, but avoided putting more blame on any particular group, instead saying hatred by "many sides" were to blame. Senate Judiciary Chairman Chuck Grassley (R-Iowa) took to the social media platform to say white nationalists were taking part in homegrown terrorism. "What 'White Nationalists' are doing in Charlottesville is homegrown terrorism that can't be tolerated anymore that what any extremist does," Grassley said. 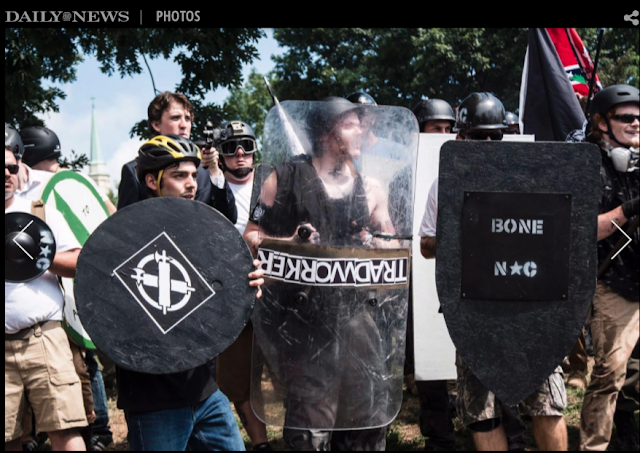 Donald Trump's incredibly unpresidential statement on Charlottesville (CNN link): A group of white supremacists -- screaming racial, ethnic and misogynistic epithets -- rallied in Charlottesville, Virginia, on Saturday. One person was killed and 19 others were injured when a car sped into a group of counter-protesters. "We condemn in the strongest possible terms this egregious display of hatred, bigotry and violence, on many sides. On many sides. It's been going on for a long time in our country. Not Donald Trump, not Barack Obama. This has been going on for a long, long time." It's hard to imagine a less presidential statement in a time in which the country looks to its elected leader to stand up against intolerance and hatred. Picking a "worst" from Donald Trump's statement -- delivered from his Bedminster, New Jersey, golf club -- isn't easy. But, the emphasis of "on many sides" -- Trump repeated that phrase twice -- is, I think, the low ebb. Both sides don't scream racist and anti-Semitic things at people with whom they disagree. They don't base a belief system on the superiority of one race over others. They don't get into fistfights with people who don't see things their way. They don't create chaos and leave a trail of injured behind them. Arguing that "both sides do it" deeply misunderstands the hate and intolerance at the core of this "Unite the Right" rally. These people are bigots. They are hate-filled. This is not just a protest where things, unfortunately, got violent. Violence sits at the heart of their warped belief system. Trying to fit these hate-mongers into the political/ideological spectrum -- which appears to be what Trump is doing -- speaks to his failure to grasp what's at play here. This is not a "conservatives say this, liberals say that" sort of situation. We all should stand against this sort of violent intolerance and work to eradicate it from our society -- whether Democrat, Republican, Independent or not political in the least. A reckoning in Charlottesville (BBC link): In the middle of Emancipation Park in Charlottesville on Saturday, two young women, one white and one black, took each other's hands and held them tightly, and with their other hands they gripped the steel barrier in front of them. A few feet away, a young white man with a buzzed haircut and sunglasses leaned towards them over a facing barrier. "You'll be on the first f*****g boat home," he screamed at the black woman, before turning to the white woman. "And as for you, you're going straight to hell," he said. Then he gave a Nazi salute. 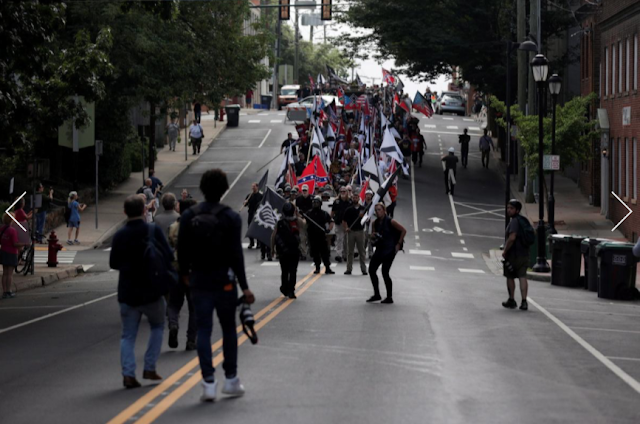 For the third time in a few months, white nationalists had descended on the small, liberal city of Charlottesville in the old Confederate capital of Virginia, to protest against the planned removal of a statue of Confederate general Robert E Lee. 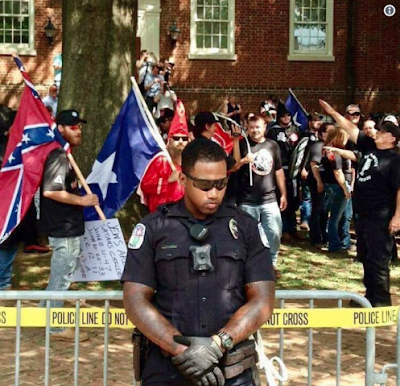 This time they came under the banner of the so-called "alt-right", for a rally they called "Unite the Right". 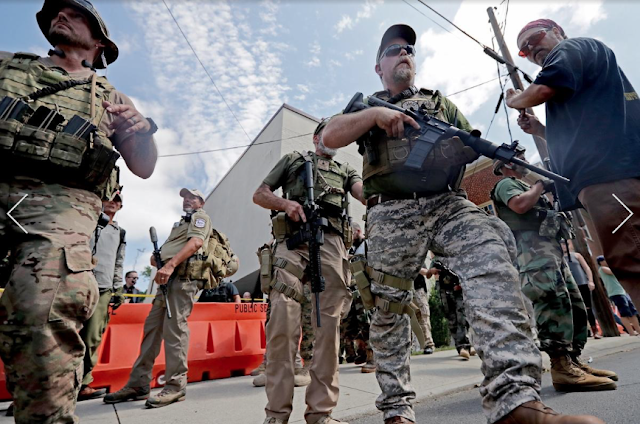 They were a motley crew of militia, racists, and neo-Nazis, and some who said they simply wanted to defend their Southern history. They gathered early in the morning at Emancipation Park - formerly Lee Park - where the statue sits, some dressed in full tactical gear and openly carrying rifles. Others wore black shirts, helmets, and boots. In a column they surged into the park, using sticks and their fists to shove aside anti-fascist counter-protesters. Then they blocked off the entrance with shields. Inside, David Duke, the former grand wizard of the Ku Klux Klan, grinned and waved as the crowd, almost entirely white and male, cheered him on, chanting his name and putting their arms up in Nazi salutes. ‘Unite the Right’ Rally-Goer Tells Fox News ‘The F------ Jew Lovers Are Gassing Us!’ (Mediaite link): In the midst of violent clashes during today’s ‘Unite the Right’ rally in Charlottesville, Virginia, one apparent white nationalist gave Fox News his unfiltered thoughts on the use of tear gas to disperse the crowds. With Fox News reporter Doug McKelway walking alongside a group of rally-goers, many of whom were armed with shields and clubs, one marcher responded that he wasn’t “exactly sure” when asked by McKelway where they were heading. “Pardon his French,” McKelway noted. The two men then continued to talk, with the rally-goer claiming he was at the march for “America” and the right to protect his right to say what he wants to say. Correct me if I am wrong, but I believe the Federal government still has jurisdiction over the San Gabriel Valley. 6:39, how can you live with yourself? Just sayin...World War II affected us, arming America is affecting us, civil rights suppression affects us, and having an unqualified mentally ill president who spews hatred is affecting us. Yes, us in the San Gabriel Valkey. MSNBC showed a video clip of the Charlottesville terrorist's mother saying that he told her that he was going to attend a Trump rally. There it is! The murdering Nazi is a Trump supporter. Drop the mic, Trump is the catalyst that is fomenting the rise in racism and hate by white supremacists groups. Trump is giving them a seat at the table and empowering these domestic terrorists to act because they know the president is with them. See Facebook, Sierra Madre Police Dept. an updated notice concerning Mr. Foot has been posted. If it is him, this may be a suicide. Are you always so helpful 10:34? The time he hasn't been seen, plus the fact that he left everything at home. I don't mean to make this sound like itvis a certainty, but those are tells. Well that point zipped right by you. Former White House communications director Anthony Scaramucci had harsh words for President Donald Trump's reaction to the violence in Charlottesville, Virginia, this weekend. Scaramucci spoke to ABC News Chief Anchor George Stephanopoulos on ABC News' "This Week" today in his first television interview since his whirlwind 11-day stint in the White House. "I wouldn't have recommended that statement," Scaramucci said of Trump's words on Saturday from Bedminster, New Jersey. "I think he would have needed to have been much harsher." "With the moral authority of the presidency, you have to call that stuff out," Scaramucci said, referring to Trump's seeming unwillingness to condemn the white nationalist rally in Charlottesville, where clashes between white nationalists and counter-protest groups forced the city to declare a state of emergency Saturday. Scaramucci went on to criticize the influence of the website Breitbart and Steven Bannon, who was the executive chairman of Breitbart before joining the Trump campaign and later the administration, saying that there's "this sort of 'Bannon-bart' influence" in the White House that he thinks "is a snag on the president." We are standing in solidarity with Charlottesville. Join us. Everyone says that Trump doesn't call white nationalists, the kkk, and neo-nazis what they really are. Not true. He calls them his base. Sorry to find Mr. Foote didn't make it. Seems to me there wasn't much of a search for him. On another note, I know most of you want Trump gone. I get that. It's gotten to the point where it's almost like he will get assasinated. If that happens do any of you realize what anarchy will follow? I guess that's what you want. Like it's not bad enough now. You prefer civil war. Trump didn't have to name the alt right or the KKK. Both sides caused problems. Instead of marching downtown do something worthwhile for a change. Offer to paint a neighbor's house that needs painting, clean up a messy lot, go to CC meetings, take care of your own city whose reps. Did some bad things on your watch! This needs to be over! #1 There were many community members searching for Carl. There was an intensive search for him.#2 If Trump is assassinated by some nutjob no anarchy will follow. Most people are more sane than you and your friends.#3 You do not live anywhere near Sierra Madre probably not in Calif, or the USA. #4 What needs to be over? "Both sides caused problems" Yes both sides murdered people. NO only the Nazi "side" did. If an Islamic terrorist drove a car at high speed into a crowd of people and killed someone? We'd be bombing Syria today. But a pudgy little white nazi from Maumee, Ohio? Not a peep from Trump. I know there was a helicopter up but it didn't seem to be up there more than a day. I apologize if I was wrong. I am saddened he was not found alive. If a nut job or anyone assassinates the Pres. There will be problems. It has nothing to do with sanity or my friends. Not sure what your thought is there. I do live in Sierra Madre. And what needs to be over is the name calling , lousy reporting, being called a Nazi, the pc culture, all of the vitriolic repartee that does not allow one to have an opinion without being labeled. I did not mean to belittle the murdered victim by saying both side caused problems. The man driving the car was a nut job. All I'm trying to say is that there is no dialogue anymore. Just this pervasive hatred that never ends. All I was made aware of is that there was a search for Mr. Foote. I stand corrected and I apologize to all those who were instrumental in finding him. The rest is same old same old. They murdered someone yesterday, 5:02. That doesn't matter in your inward gazing world? 5:02 doesn't get that there can be no dialogue with the small percentage of the population that knows nothing but hate, especially now that they have the backing of Trump who was installed by Putin. 5:07 Good Grief! I never condoned what the driver did. I haven't read that anyone else is involved. Inward gazing! I give up. How many were killed in Chicago over the weekend? There are many areas of concern in this country that perhaps your "inward gazing" can't accept. You obviously don't read much. There was a huge search for him. We heard the helicopters all day. The foothills are a draw for both nature lovers and troubled souls. The helicopters were for something else over by Bailey Canyon. Yes many turned out to look for Carl both downtown and on the Mountain. A few bloggers on this site are not on their meds or could be overmedicated. Which president? Trump or Putin? Please explain 2:18 how you cannot think Trump is mentally ill. If he isn't then he is a traitor, plain and simple. The Tattler always has that interesting column to the right of the page that lists the most viewed articles of the week - just seems so odd that a Bart Doyle one is up there. Wonder why? 5:02 - When you frame nazis as just people with different political views, you are legitimizing genocide as a political position.